The Reax Mini by Aspire is an Electronic Cigarette, simple and small in size for a vape in all circumstances. This is an Electronic Cigarette equipped with a Reax Mini small box. Fine and light with a splendid design, which sits comfortable in palm of your hand. It is also integrated with a rechargeable battery of 1600 mAh and proposes 5 different types of vaping power from 8W to 16W. In "Bypass" Mod has coils inferiors of 1.0 ohm. This box is ideal for a vape in indirect inhaling but is not reluctant to produce more vapor. With this Reax Mini Box, which is simple to use, the Tigon Clearomiser also brings easy utilisation. The Tigon Clearomiser has a secured and hermetic filling of the reservoir. The Tigon Clearomiser offers the luxury to change the coil with the reservoir filled with e liquid. 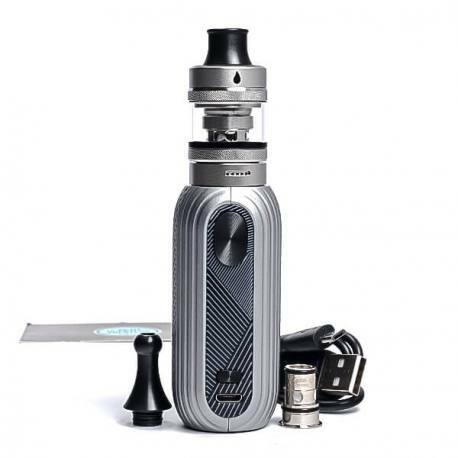 Delivered with 2 Tigon Coils in Nichrome 80 of 1.2 ohm and 0.4 ohm, the Reax Mini Kit offers 2 types of vape: indirect inhaling (MTL) and direct inhaling for a more power and vapor (DTL). The Reax Mini Box automatically detects the value of the coil. With the Tigon 1.2 ohms coil, the Reax Mini offers 5 different output power of 8W to 16W. With the 0.4 ohm, the mod automatically passes in "Bypass" Mode delivering a power available with the battery. Small, elegant and performant, the Reax Mini by Aspire is ideal to begin the Electronic Cigarette or a vape with a discreet and light model, offering an efficient vape, in all styles. Coils compatible with the Tigon Clearomiser by Aspire. The Reax Mini is a simple to use Electronic Cigarette. Dotted with an original and ergonomic design, of a small size allowing a vape in all occasions. 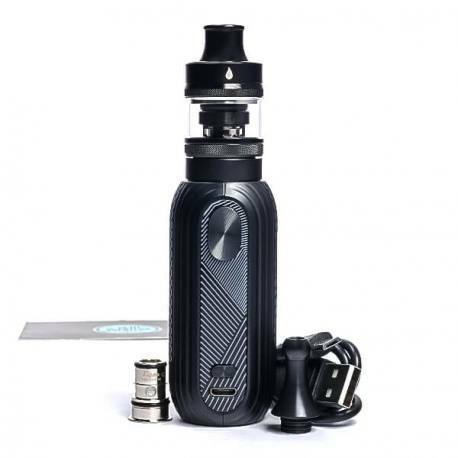 The Reax Mini Kit equally offers good performance with a rechargeable battery of 1600 mAh and a certain polyvalence by proposing a vape with 5 pre-settings in watts. Also with the Bypass mode for the coils below 1.0 ohm. All in a few clicks. It is not necessary to have technical knowledge to master the Reax Mini Electronic Cigarette. The Tigon Clearomiser of the Reax Mini Kit offers excellent utilisiation comfort, with a a filling from the top of 2ml in e liquid. Changing the coil can also be effectuated without having to empty the reservoir. Th aeration of the Clearomiser is set from the base of the Clearomiser and offers a pull which can be tight or aired. The Reax Mini Kit also offers a polyvalent vape depending on your needs and preferences. The Reax Mini is in effect delivered with 2 Tigon Coils which allows a vape in Indirect Inhaling (MTL) or in Direct Inhaling for even more sensations. The Reax Mini Box automatically passes in Bypass Mode with the coil of 0.4 ohm. This also leaves you the choice of power with the 1.2 ohms and 5 pre-settings with 8 to 16Watts. To whom addresses the Reax Mini Aspire? Convenient and practical, the Reax Mini addresses vapers who want an Electronic Cigarette without complications. Beginners in vape will also find what they are looking for. It is not necessary to have great knowledge with vaping material to master the Reax Mini Kit. 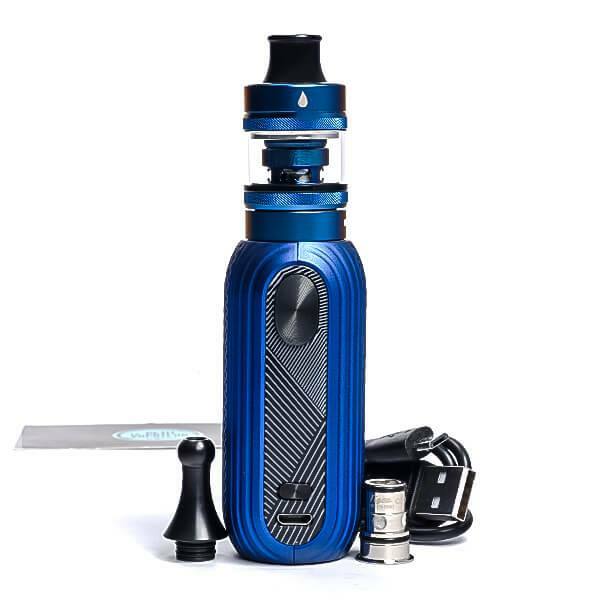 With a small size and ergonomic design, the Clearomiser is hermetic and clean, the Reax Mini Kit is made for vaping everywhere and for all occasions. Two coils which offer a different vape, but also complementary. Direct or Indirect Inhaling, you are the master! The Reax Mini Box has a design and round curves for beautiful and original aesthetics and especially an impeccable hold in the hand. This light mod is electronic and made for a daily vape. The emphasis is of course on the ergonomics. 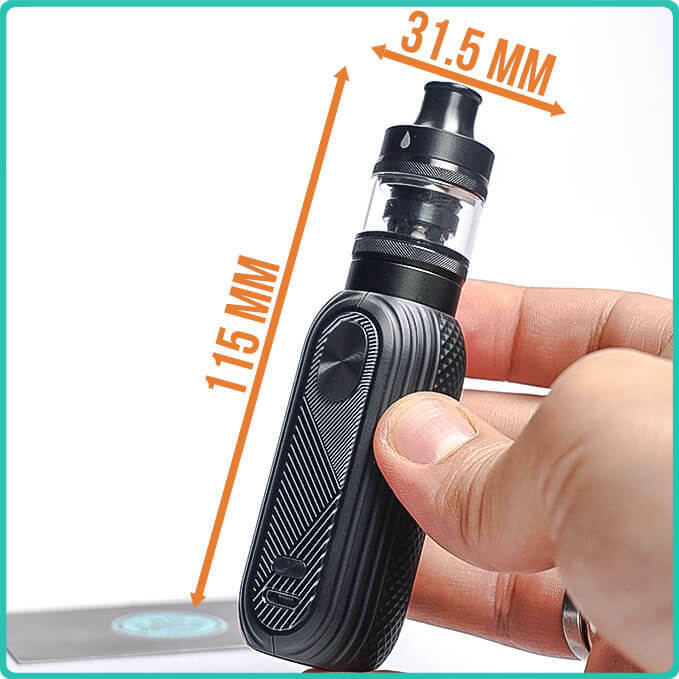 the size is compact, and the mod only measures 7cm in height, and it will please the vaper who is in search of an Electronic Cigarette which slides in the pocket. The Reax Mini has 6 settings. With a simple click it can modify the power in watts for the coils which have a value equal or superior to 1.0 ohm. Below 1.0 ohm, the Reax Mini automatically passes over to Bypass mode. The box has a maximum power which the battery can supply. The mod remains entirely secured with (short-circuits, low based voltage etc...) and it can accept coils from 0.3 ohm. The Reax Mini displays the power you use in a very original way as it indicates the information under the mod. With 1600 mAh. the Reax Mini allows you an all day long vape depending on the Tigon Clearomiser. The 1.2 -hm coil, a little bit gourmet in energy can offer long hours of vape. The Reax Mini can be recharged via the USB Micro Cable supplied. 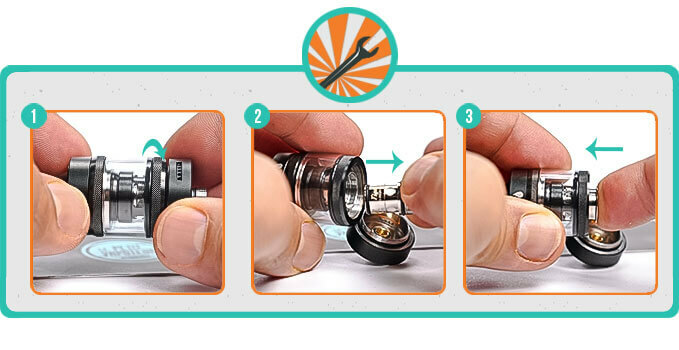 The Clearomiser is the most convenient part for vaping. 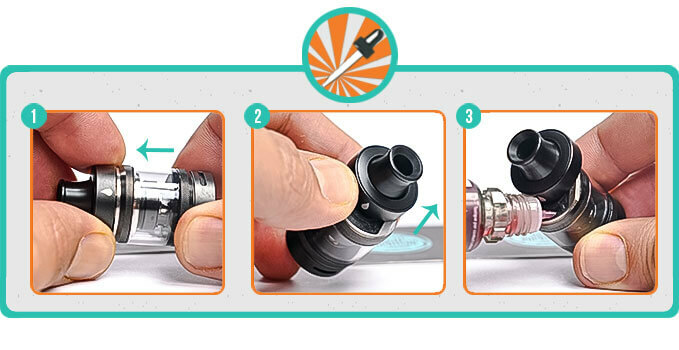 The Clearomiser 22mm in diameter (at the base) can hold up to 2ml in e liquid. It has a clean and hermetic filling by sliding the top-cap towards the back. The aeration of the pull can be adjusted by the base. To effectuate this it is simple enough to turn the Airflow ring. The Tigon Clearomiser is also delivered with 2 drip tips for render of different flavours. To offer two types of vape depending on your preference, Aspire has included in this Reax Mini Kit, 2 Tigon coils. These Tigon Coils are made with one of the best resistive wires in terms of rendering of flavour: Nichrome 80. The Tigon 0.4-ohm coil is adapted for e liquids which has a strong dose in Vegetable Glycerine and produces more vapor. It can be used from 23W to 28W. 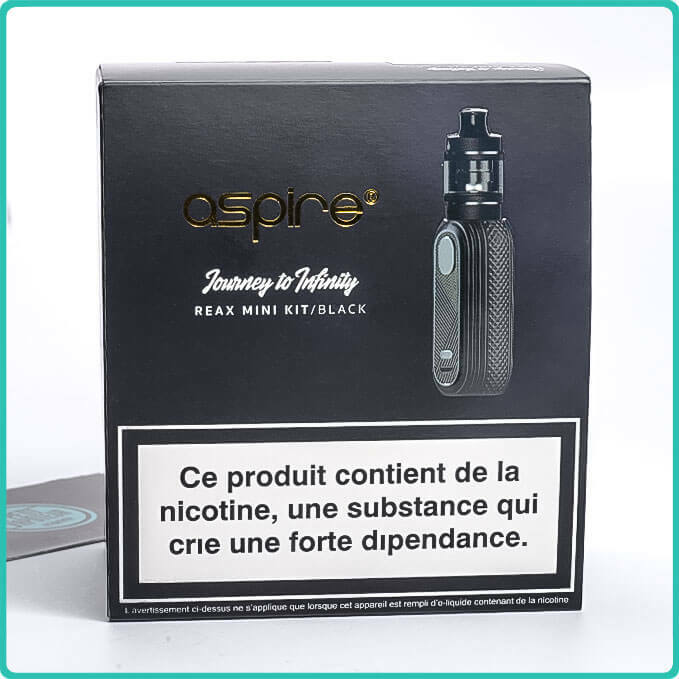 The Reax Mini Box is made by Aspire.